I use Queen of Abruzzo cuisine Anna Teresa Callen’s recipe for Pasta fagioli con le cotiche all ‘Abruzzese in her wonderful English language recipe book Food & Memories of Abruzzo. She uses Italy’s most beautiful and tasty borlotti beans to make this traditional Abruzzo soupy bean stew. For all those doubters that think you can do without the dare I say it the prosciutto or gammon skin don’t even think about it, you will end up losing the flavour that this unique dish has if you leave it out. It does take a while to make, so it’s great if you are snowbound or have a free evening. I personally think this Abruzzo starter is best made the day before and left to stand to let all the flavours gently infuse. 1 Gammon Ham Bone – if you can get a prosciutto bone all the better! Wash the beans and plunge them in boiling water. Cook for 10 minutes then rinse under hot water. Place them in a large pot and cover with water. Bring to the boil over a high heat and cook for 10 minutes. 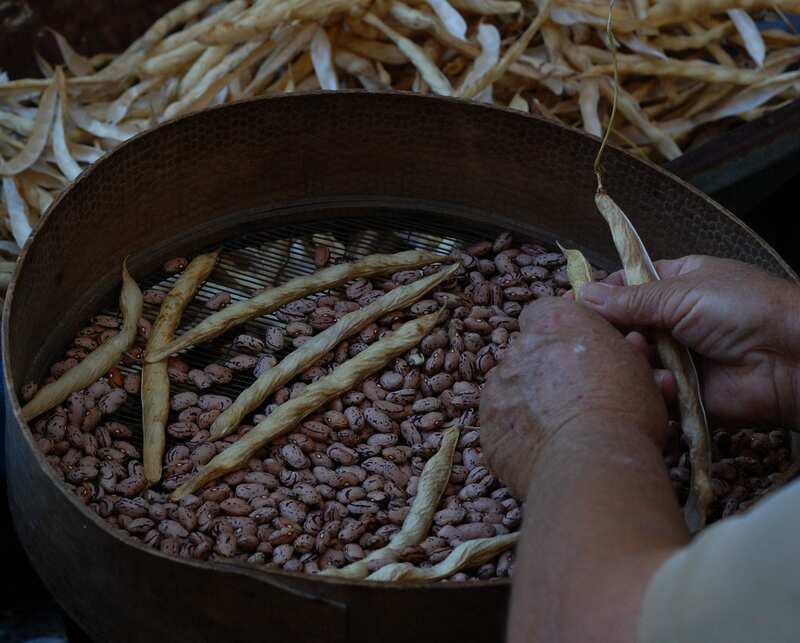 Drain and rinse under cold water, this removes the indigestible ‘patina’ on the skin of the beans. Set aside. Add the dried beans to the pot, add the bone, the celery, garlic, parsley, & bay leaves. Add 3 litres of cold water and bring to the boil. Add the prosciutto rind to the bean and reduce he heat to medium low. Cover the pot and simmer for about 2 hours until the beans are tender. Start checking them after 1.45 hours. Prepare the sauce. Chop finely the prosciutto, vegetables and parsley. If you have a food processor chop finely. With a slotted spoon, remove the celery, garlic and parsley that was cooked with the beans. Place these in a food processor and add 150gms of the beans and puree. If you don’t have a food processor a pestle or mortar will do the trick equally as well of the back of a spoon. Remove the bone from the beans and cook. Remove the bay leaves and discard. Scrape all the meat from the bone, and chop if the pieces are big. Return the meat to the pot together with the bean puree. Add the sauce, bring the soup back to the boil, reduce the heat to lower and simmer for another 10 minutes. Meanwhile cook the pasta as you would normally in plenty of salted boiling water but only for 5 minutes. Drain, keeping 450 ml of the pasta water. Add the pasta to the beans and some of the reserved water depending on how soupy or stewy you like your minestra. Bring it back to the boil and cook until the pasta is done – 5-8 minutes. Let the soup rest for at least 5 minutes before serving or ideally make the day before for the flavours to infuse. my roots, both parents born in abruzzi,Sante Omera, i learned to cook from them, the dishes, i return to abruzzi every summer, i work in usa my soul is in mountains of abruzzi, your recipe is fine BUT you want to fast track the dried bean process. overnite soaking is needed, changing cold water a few times. i cring at the canned bean cooks, please no shortcuts, do not serve until 2nd day after you prepare so the beans can give their true flavor to the dish.